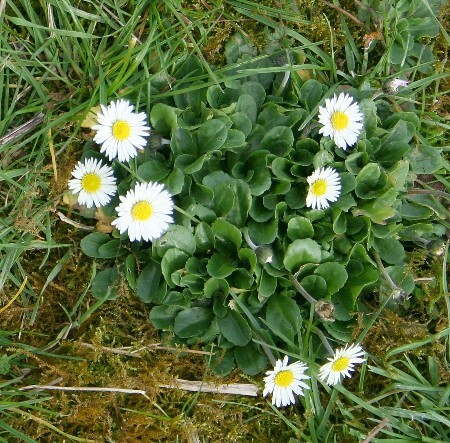 The simple daisy which gets their name from Anglo Saxon 'Daes Eage' or days eye - a reference to the way the flowers open in the sun and close again at night. Farmers used to say that if you could stand on seven flowers at once summer was here. A little early for summer but safe to say that spring is firmly established. 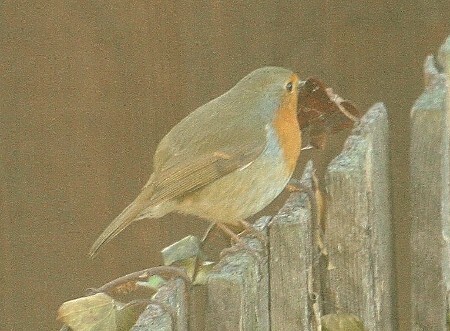 Robin's are busy with their nest building and dog violets cover the ground. Snowdrops are starting to lose their flowers but are now replaced by the bright, yellow, daffodils dancing in the breeze - maybe the North Downs do not have the numbers that made Wordsworth heart fill with pleasure along the banks of Ullswater but, like little rays of sun, their appearance lifts the spirits. Sadly not all of the damage is accidental or due to the effects of time, one of the signposts along the section we monitor has been removed, once again. Some things don't seem to change, the post 'vanished' last year only to reappear in November. Another thing that can be guaranteed to occur on a regular basis throughout the year is the appearance of burnt out abandoned cars. This is the first one we have come across on our section during 2007 and not likely to be the last. Looks like this one shouldn't be around for long though. Trees including the Sallow are bursting into life all along the footpath and wild garlic and bluebell leaves are turning the woodland floors green. The scene changes every day and it shouldn't be long before we are treated to the heavy aroma of garlic and bright blue flowers turning the forest glades into a sea of colour. The past. We have walked past this spot many times but never noticed what was below us until recently when we spotted rails heading into the hillside, perhaps our attention has been drawn to the grapes in the nearby vineyard too often and we completely missed what was literally under our feet. A sign of the regions industrial past, rail lines heading into the opening face of an old mine. Mining sandstone in this area started in the 17th century and this Firestone proved to be best suited to lining furnaces and fireplaces, a sub stone Hearthstone was also used by the fashionable set to whiten masonary. Mining continued until the early 1900's when more durable stone and bricks became available. Plans were drawn up at the outset of the Second World War to use the extensive network of passageways as underground shelters to house Londoners escaping the blitz, but this wasn't pursued. Apparently not all of the entrances were found. Nowadays the mines are used by local cavers, so don't be surprised if a wet, muddy person dressed in rubber with a headlamp suddenly appears out of knowhere. The present, it is said that there is one CCTV camera for every 14 people in the UK and that in London you can be followed by up to 300 cameras during the day. Even walking in the countryside offers little escape. This herd of deer we came across enjoying a lazy sunny afternoon have no need for electronic surveillance with their keen sense of smell and hearing they still managed to notice that we were walking past, even though we were on the edge of a thicket hidden by trees and they were several hundred metres away on the opposite side of the valley. On this occasion we certainly didn't mind a wary eye following our movements as we wandered by. It is very easy to be complacent about the things that surround you in life and assume that dates and times have always been the same as we now know however, until 1752, March was actually the first month in the calendar year. Time then to actually make a start on those New Year resolutions. Inspired by all the joggers would we be able to do a 26 mile day walk by the date of the London Marathon in April? 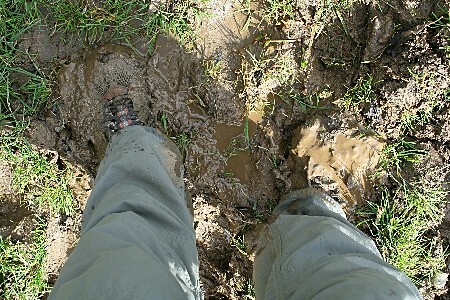 Given the path conditions early in the month we might have been better off training for the Boat Race. The prophetic shadow cast by February's rabbit warning of six more weeks of winter weather seemed to have come true as early March brought thunder and lightning, strong winds and fleeting showers mixed with hailstones. No surprise that Anglo Saxons referred to March as 'Hyld Monath' - the stormy month. 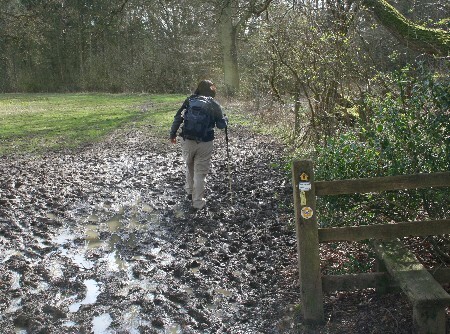 The temperatures over the past few months may have been mild but the unusually high levels of rain turned many of the paths into boggy, quaggy tracks, not for long though as temperatures shot up to a summer like 16 degrees. The rabbit still had one final trick in it's hat! 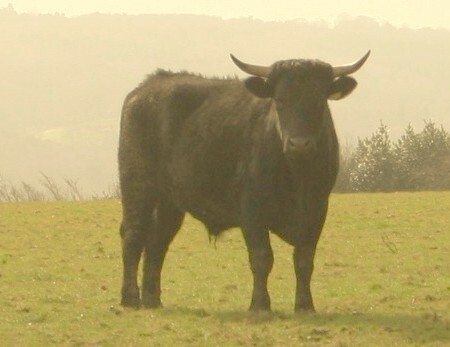 We have had quite a few close calls with cows and bulls in the past, most notably on the Dales Way when a herd of young bullocks bolted past us, trampling down a gate and ran off up a country lane as we entered their field. So we took no chances when we noticed a herd of cows and this young bull taking a very close interest in our movements and starting to head towards us. Rather than follow the official path which would have taken us through the herd of cows we opted to continue in a field at the side and discovered the reason for the bulls anxiety. 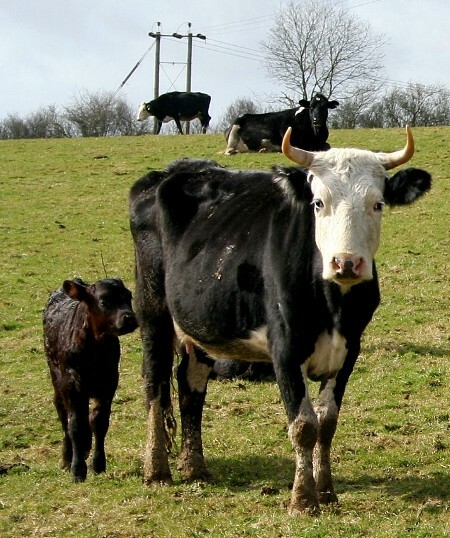 Several cows were caring for recently born calves. 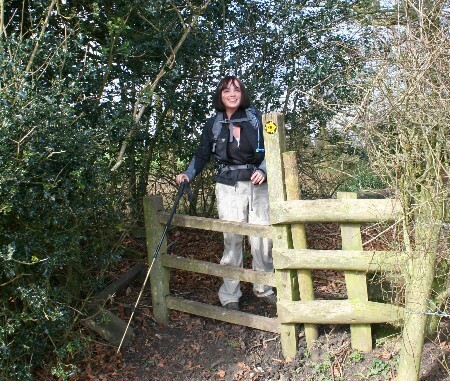 Although the North Downs Way is one of the recognised National Trails receiving governmental funding from Natural England the maintenance of the path is both costly and time consuming, relying heavily on the work of local authorities, landowners and volunteers. Whilst the simple things such as clearing away fallen trees, waymarking and clearing overgrowth can be dealt with quickly, larger problems such as damaged stiles and gates are not only a drain on the minimal funding but not as easy to deal with. Although this stile (on the left) has rotted away and been damaged it is still possible to clamber over the fence - this of course will put extra strain on the fence and may lead to further costly damage if the stile isn't repaired soon. Perhaps we have been lucky with the weather so far, most days we have been out on the downs this month it has been very mild, with the sun shining down, a few days of warm weather soon dried out the boggy paths encouraging us to get out as often as possible and we were able to comfortably cover 20 miles on a days walk, although our feet are still trying to come to terms with the extra miles! An advert for a brand of outdoor gear at Waterloo Station states 'This may be the only moment when you are in England and know what the weather is like - Enjoy'. 24 hours after walking along a dusty path that looked as dry and cracked as in summer it was all gales and hailstones again! A very wet Mothering Sunday - today the original meaning of this old traditional 'holiday' has been lost and even appears to have had a slight name change courtesy of the greetings card companies busy selling 'mothers day' cards. 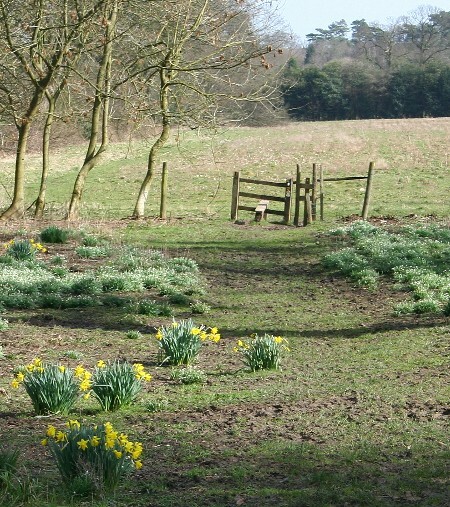 In the past children would have collected posies of Primroses and Violets picked from local fields. Always on the 4th Sunday in Lent it developed into a day of family reunion when people would worship at their local large or 'mother' church - servants, apprentices and maids would have been allowed to take the day off. It was not uncommon for children as young as 10 to have been sent away from home to work on country estates such as those around this part of the North Downs - Chevening, Titsey and later in Victorian times to work in the increasing number of affluent houses built as London expanded into the suburbs around Croydon. Orpington, Merstham, Oxted and Otford. It is likely that, centuries ago, there would have been a lot of activity along the old track ways that cross or run along the North Downs as they made their way home over the weekend. Some would even have been heading to Kent's 'mother church' The Cathedral at Canterbury, perhaps using this part of 'The Pilgrims Way' which is still visible and easy to identify but now a minor road running along the valley between the M25 and The North Downs Way. Last September the hedgerows were full of ripe sloes, the fruit of the blackthorn, now it's dark winter skeleton is starting to glow again as the first new blossoms and leaves appear, the cycle begins again. Men at work - not something you normally come across on long distance footpaths - the bridge that takes the North Downs Way over the A22 is being replaced. ..............and in with the new. The first lambs of spring, although looking quite fat these have probably been born much earlier in the year and kept inside until it was warm enough to let them out to graze. And we are starting to see Wood Anemone's, or the Windflower, which in Greek mythology arose from the tears of Venus as she wandered through the woodland weeping for the death of Adonis. ' Where streams his blood there blushing springs a rose. And where a tear has dropped, a windflower blows.' Quite romantic for something that although very attractive to look at is actually poisonous. Is it summer? Well it is now six weeks after Candlemas Day and the wintry spell cast by the rabbits shadow.